1Department of Nutrition and Operational Support Services, Princess Alexandra Hospital, Brisbane, Australia. 2Department of Pathology, University of Queensland, Brisbane, Australia. 3Department of Medicine, University of Queensland, and the Population and Clinical Sciences Division, Queensland Institute of Medical Research, Brisbane, Australia. 4Population and Clinical Sciences Division, Queensland Institute of Medical Research, Brisbane, Australia. 5Department of Endocrinology, Princess Alexandra Hospital, Brisbane, Australia. 6Department of Surgery, University of Queensland, Brisbane, Australia. 7Department of Surgery, University of Queensland, and Department of Gastroenterology and Hepatology, Princess Alexandra Hospital, Brisbane, Australia. Background: Steatosis occurs in more than 50% of patients with chronic hepatitis C and is associated with increased hepatic fibrosis. In many of these patients the pathogenesis of steatosis appears to be the same as for patients with non-alcoholic fatty liver disease—that is, related to visceral adiposity and obesity. Methods: The effect of a three month weight reduction programme on liver biochemistry and metabolic parameters was examined in 19 subjects with steatosis and chronic hepatitis C. Paired liver biopsies were performed in 10 subjects, prior to and 3–6 months following the intervention, to determine the effect of weight loss on liver histology. Results: There was a mean weight loss of 5.9 (3.2) kg and a mean reduction in waist circumference of 9.0 (5.0) cm. In 16 of the 19 patients, serum alanine aminotransferase levels fell progressively with weight loss. Mean fasting insulin fell from 16 (7) to 11 (4) mmol/l (p<0.002). Nine of 10 patients with paired liver biopsies had a reduction in steatosis irrespective of viral genotype. In these subjects the median modified Knodell fibrosis score decreased from 3 to 1 (p=0.04) and activated stellate cells significantly decreased (p<0.004). Conclusions: Weight loss in patients with chronic hepatitis C may be associated with a reduction in steatosis and abnormal liver enzymes and an improvement in fibrosis, despite the persistence of the virus. Weight reduction may provide an important adjunct treatment strategy for patients with chronic hepatitis C.
Hepatitis C virus (HCV) is a major cause of chronic liver disease with an estimated 170 million chronic carriers worldwide. Most infections are persistent and the majority of cases develop chronic liver disease with various outcomes, ranging from an asymptomatic carrier state to chronic hepatitis, cirrhosis, and hepatocellular carcinoma. Although the therapy of chronic HCV has improved substantially during the last decade, complete recovery occurs in less than 50% of treated patients. With the standard regimen of interferon alpha-2b in combination with ribavirin for 24–48 weeks, a sustained virological response is achievable in only 30–60% of treated patients.1–3 In clinical practice, many patients with chronic HCV ask about lifestyle modification, including dietary manipulations, to improve their liver disease. Apart from avoiding alcohol, there is a paucity of data regarding lifestyle changes that are associated with amelioration of liver injury. We hypothesised that weight reduction in patients with chronic HCV would be accompanied by a decrease in the degree of hepatic steatosis and a reduction in circulating insulin levels. Our second hypothesis was that a reduction in steatosis would be associated with an improvement in hepatic inflammation and fibrosis. To investigate these hypotheses, we studied the effect of a three month weight reduction programme on liver biochemistry and metabolic parameters in 19 subjects with chronic HCV. To investigate the effect of weight loss on liver histology, paired liver biopsies were performed in 10 subjects, prior to and 3–6 months following the intervention. Twenty three subjects with steatosis and chronic HCV seen in the Hepatitis Management Clinics at the Princess Alexandra and Royal Brisbane Hospitals between July 1999 and August 2000 were invited to participate in the study. Informed consent was obtained from each patient and the study protocol was approved by the hospital research ethics committees. Criteria required for entrance into the study were: (a) chronic HCV with circulating HCV RNA (detected by Amplicor HCV Monitor assay; Roche, New Jersey, USA) and abnormal serum aminotransferase levels for at least 6 months; (b) liver biopsy demonstrating ≥grade 1 steatosis; (c) alcohol consumption <70 g/week; (d) ineligibility or unwilling for current antiviral treatment; and (e) residence within metropolitan Brisbane to enable weekly attendance at clinic during the three month weight reduction programme. Four subjects withdrew in the first four weeks due to exacerbation of schizophrenia (n=1), excessive alcohol consumption (n=2), or an increase in work commitments preventing clinic attendance (n=1). In 13 subjects a liver biopsy was performed within a 12 month period prior to commencement of the weight reduction programme. Ten of these patients consented to a repeat liver biopsy 3–6 months following completion of the intervention. During the 12 week intervention period, subjects were counselled on an individualised energy restriction and exercise regimen to promote a goal of 0.5 kg weight loss per week. In order to expedite weight loss, dietary restriction and exercise were initiated simultaneously. It was recommended that diets be composed of nutrients contributing to total energy as 55% carbohydrate, 15% protein, and 30% fat. No vitamin, mineral, or herbal preparations were taken during the intervention. Subjects were seen weekly by the dietitian during the intervention and monthly during the 12 month maintenance period. Weight and waist circumference measurements and details on alcohol, exercise, and diet history were recorded at each visit. A seven day diet diary was completed once per month during the intervention period. The macronutrient content of the diets was analysed using Foodworks version 2.10.133 (Xyris Software 1998–2000, Australia). Subjects were required to limit alcohol to <20 g/week during the intervention period. Alcohol intake was averaged and recorded as grams per week. Liver biopsy specimens were fixed in 10% neutral buffered formalin and embedded in paraffin. Steatosis was graded as follows: 0; 1 (<30% of hepatocytes affected); 2 (30–70% of hepatocytes affected); or 3 (>70% of hepatocytes affected). The degree of inflammation and fibrosis was assessed and graded using the modified Knodell scoring system of Ishak and colleagues.9 The sections were analysed by an experienced hepatopathologist (AC) who was blinded to patient identity and time of biopsy. The extent of α smooth muscle actin (α-SMA) staining was determined as a marker of stellate cell activation in the paired liver biopsy samples. Immunohistochemistry was performed on sections of formalin fixed paraffin embedded liver using a monoclonal antibody for α-SMA (1:120, clone 1A4; Dako, Denmark) as previously described.10 Cells that were α-SMA positive were counted in 10 separate areas using an ocular grid and the number of positive cells calculated per mm2. Portal and acinar areas were assessed separately. Continuous normally distributed variables (such as weight, BMI, waist circumference, and insulin and macronutrient intake) were summarised as mean (SD) (mean (SEM) for graphical presentation). Alcohol intake, degree of steatosis, stage of fibrosis, and inflammation scores, all being either skewed or ordinal, were summarised using the median. The degree of association between continuous normally distributed variables (such as between BMI and insulin) was assessed using Pearson's correlation coefficient (r). The degree of association between any non-normal variables (such as between changes in steatosis and weight loss) was measured using Spearman's non-parametric correlation coefficient (rs). The significance of the effect of the intervention, assessed in terms of changes in weight, BMI, waist circumference, as well as biochemical changes, was assessed using paired t tests. Changes in the degree of steatosis, stage of fibrosis, or grade of inflammation over the intervention period were assessed using the Wilcoxon signed rank test. All analysis was done using SPSS version 10.0. Statistical significance was taken at the 5% level. Demographic information for those 19 patients who completed the programme is detailed in table 1. The age of the patients ranged from 29 to 67 years (mean 43 (8.2)). All subjects were HCV RNA positive with viral genotype 1 (n=11), 2 (n=1), or 3 (n=7). Mean BMI of patients prior to intervention was 30.2 (5.0) kg/m2 (range 21–40). Mean waist circumference was 102 (7) cm in males and 98 (14) cm in females (range 74–119). Median prior alcohol intake was 0 g/day. At entry, 12 of the 19 subjects had grade 2 or 3 steatosis, and seven had moderate to severe fibrosis with a Knodell fibrosis score of 4–6. Mean fasting cholesterol, triglycerides, and glucose levels were within the normal range. 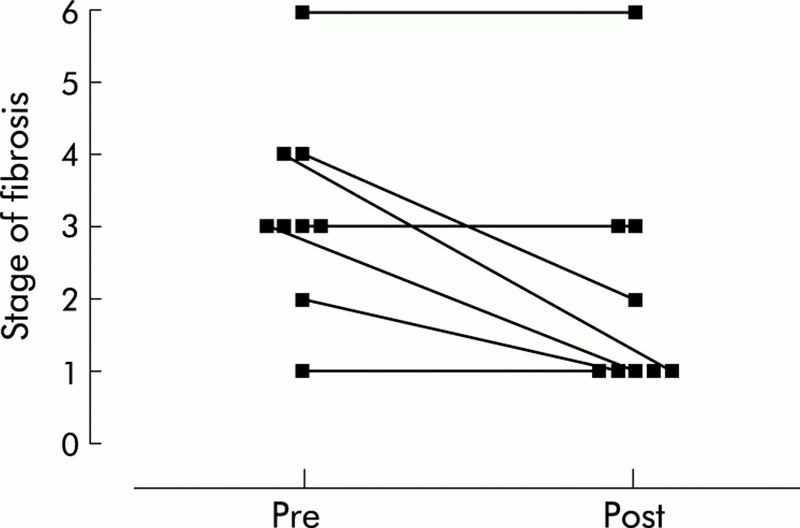 Fasting insulin levels were mildly elevated and were significantly associated with BMI (r=0.58, p=0.02) (fig 1). 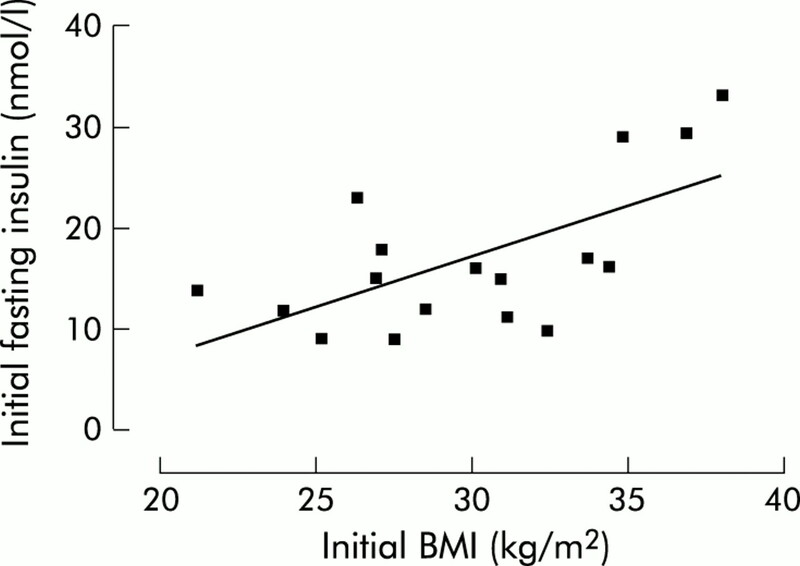 Correlation between fasting serum insulin and body mass index prior to weight reduction (r=0.58, p=0.02). Twelve patients had received prior antiviral treatment, either with a single course of interferon monotherapy (n=6) or a combination of interferon and ribavirin (n=2), or repeated courses of both monotherapy and combination therapy (n=4). In the 10 subjects with paired liver biopsy samples before and after weight reduction who had previous antiviral treatment (n=5), the “pre” liver biopsy was taken at least six months after completion of antiviral therapy. These details have been documented in table 2. There was no difference in demographic, biochemical, histological, or dietary parameters between those patients with and without a repeat liver biopsy. However, there was a greater number of subjects with viral genotype 3 in the group that was rebiopsied (p=0.04). The 19 subjects (11 males, eight females) who completed the programme all lost weight, with a mean weight loss of 5.9 (3.2) kg (range 1.6–11.9), resulting in a mean decrease in BMI of 2 (1) kg/m2 (p<0.0001) and a mean reduction in waist circumference of 10.4 (3.6) cm in males and 7.0 (6.3) cm in females (range 1.5–19.5) (p<0.0001, table 1). Prior to the study, all subjects had a sedentary lifestyle with no regular exercise. During the intervention period, all subjects recorded an increase in activity to an average of 30 minutes aerobic exercise per day (data not shown). Diet diaries revealed a significant reduction in energy intake with mean change from 11 500 to 6800 kJ/day (2740 to 1620 calories/day) (p=0.002) and reduction in total fat content with a mean change from 94 to 52 g/day (p=0.003). At enrolment, dietary composition was 50% carbohydrate, 20% protein, and 30% fat. At completion, there was a tendency to increase per cent carbohydrate and decrease per cent fat, although this was not statistically significant (p=0.07 and 0.39, respectively). In 16 of the 19 patients, serum alanine aminotransferase (ALT) levels fell progressively with weight loss. Overall, the mean ALT level decreased from 137 (80) to 94 (67) U/l at week 12 (p=0.002, fig 2). 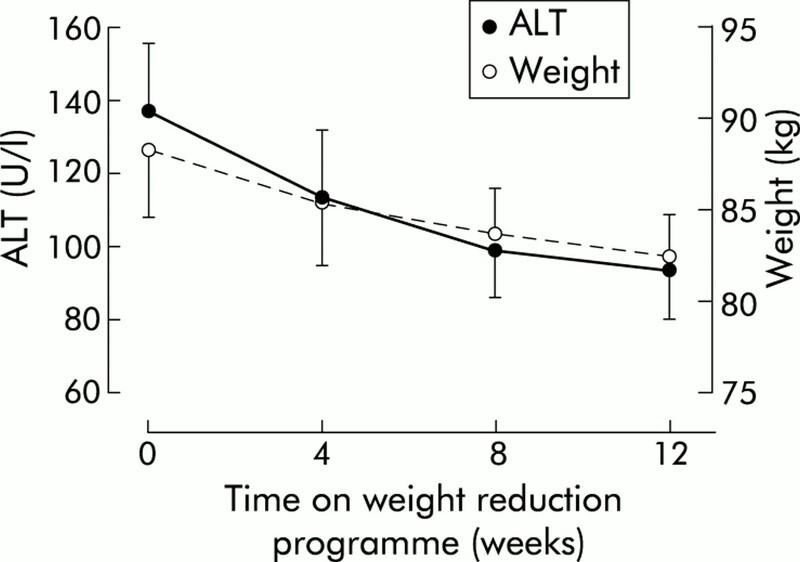 Decrease in weight and serum alanine aminotransferase (ALT) levels during the 12 week intervention period (mean (SEM), n=19). Mean fasting insulin fell from 16 (7) to 11 (4) mmol/l (p<0.002). Females had a significantly higher initial fasting insulin level than males (p=0.026) but after weight reduction there was no significant difference. Mean HOMA score decreased from 4.2 (3.3) to 2.5 (1.1) (p=0.03). There was a general downward trend in cholesterol and triglyceride levels pre and post weight reduction but these were not significant. Paired pre and post treatment liver biopsy specimens were available from 10 patients (table 2). Nine of the 10 patients had a reduction in steatosis (median reduction of one grade) irrespective of viral genotype (p<0.005, fig 3) Representative photomicrographs of liver biopsies pre and post weight reduction are shown in fig 4. The degree of reduction in steatosis was significantly associated with percentage weight loss (rs=0.81, p=0.005). Grade of hepatic steatosis in patients before (Pre) and after (Post) weight reduction (median pre=2; post=1, p<0.005). 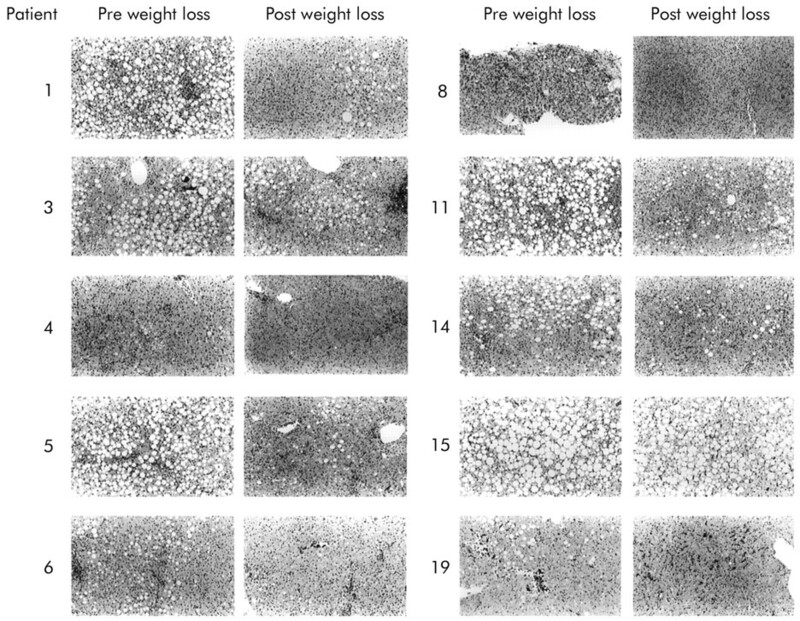 Representative photomicrographs of each paired liver biopsy before (Pre) and after (Post) weight reduction (haematoxylin and eosin; original magnification×100). Five of the nine subjects with a reduction in steatosis demonstrated a decrease in fibrosis while in four subjects fibrosis was unchanged (p=0.04, fig 5). In the subject with persistent severe steatosis, fibrosis increased. Deposition of mild fine perisinusoidal collagen in the acini was seen in 9/10 patients initially but disappeared on repeat biopsy in three of these cases. Activated stellate cells, detected by α–SMA staining, were reduced in both portal tracts and acini in 8/10 patients following dietary intervention. The median number of α–SMA positive cells in the portal tracts and acini decreased from 333 (322) to 149 (200) cells/mm2 and 32 (28) to 3 (16) cells/mm2, respectively (p=0.004, table 2). The median histological activity index for all 10 subjects did not significantly decrease (p=0.14) although the reduction in acinar inflammation approached significance (p=0.08, data not shown). To date, eight subjects have had at least six months of follow up after completion of the dietary intervention (range 6–18 months). Three of these subjects have regained >25% of their lost body weight (28%, 48%, and 85%). These results demonstrate for the first time that weight reduction in patients with chronic HCV may reduce hepatic steatosis, irrespective of viral genotype. The reduction in steatosis may be accompanied by a significant decrease in stellate cell activation and in some cases (5/9) regression of hepatic fibrosis was demonstrated. Most patients with chronic HCV and steatosis were in the overweight or obese weight range (26–35 kg/m2) and had significant visceral adiposity, as demonstrated by an elevated waist circumference (>94 cm in males and >80 cm in females).12, 13 In these patients, loss of as little as 2.6% body weight resulted in a reduction in steatosis, with a significant association between the amount of body weight lost and the degree of change in steatosis. However, at least two patients with HCV genotype 3 were not overweight, suggesting that their steatosis may be due to a cytopathic effect of the virus, as previously described.5, 14–17 Interestingly, even in these lean patients with HCV genotype 3, weight loss was accompanied by a significant reduction in steatosis. The mechanisms by which weight loss and a reduction in steatosis improve portal inflammation and fibrosis in chronic HCV remain to be determined. Steatosis is associated with an increased production of reactive oxygen species which initiate lipid peroxidation, resulting in activation of hepatic stellate cells. The mechanism for this is not precisely known although recently steatosis has been shown to alter the expression of mitochondrial membrane proteins, including uncoupling protein 2.22 This protein has been implicated in the generation of reactive oxygen species and lipid metabolism.23 Irrespective of its effect on steatosis, energy restriction may also have a direct effect on the inflammatory response associated with HCV. In various rodent models, calorie restriction has been shown to reduce the intensity of inflammation and levels of proinflammatory cytokines.24, 25 In our patients, energy restriction was modest, and the effect of the dietary intervention in the absence of steatosis was not addressed. Despite the overall decrease in ALT with weight loss, this was not correlated to the reduction in steatosis in our patients. In these patients with steatosis and chronic HCV, fasting serum insulin levels were mildly elevated and significantly associated with BMI. Fasting hyperinsulinaemia and HOMA score are commonly used as surrogate markers for insulin resistance and occur frequently in overweight individuals. It has been suggested that insulin resistance may contribute to hepatic steatosis by a number of mechanisms. In lean individuals, insulin inhibits hormone sensitive lipase, providing control over the release of free fatty acids from adipocytes. In contrast, in obesity the loss of insulin sensitivity at the level of the adipocyte results in increased movement of fatty acids from peripheral stores to the liver. In addition, one of the actions of insulin in the liver is to increase the transcription of genes involved in fatty acid synthesis.26 This stimulation may be responsible for the increase in triglyceride levels in the liver and plasma that accompany hyperinsulinaemia. Compliance in this cohort of patients was very good, with a mean weight loss of 5.9 kg over a 12 week period. This was achieved by a combination of intensive weekly intervention by a dietitian, restriction in energy intake, and an increase in daily activity. The contribution of each component to the change in liver biochemistry and histology could not be differentiated in our patients but will be of great interest in future studies. Maintenance of this weight loss may be challenging, as in a recent review of long term outcomes after lifestyle interventions alone, individuals regained around 60% of the weight they had originally lost after one year.27 However, our follow up to date has been encouraging, and perhaps the motivation of patients with a chronic disease and no other immediate treatment options may improve compliance with dietary and lifestyle modifications. This study has demonstrated that weight loss in patients with chronic HCV is achievable and may result in a reduction in hepatic steatosis, irrespective of viral genotype. A small amount of weight loss may be associated with a reduction in abnormal liver enzymes and an improvement in fibrosis, despite the persistence of the virus. We believe that weight reduction may provide an important new adjunct treatment strategy for patients with chronic HCV. The Princess Alexandra Hospital Research and Development Foundation and the Department of Nutrition and Operational Support Services, Princess Alexandra Hospital are gratefully acknowledged. Poynard T, Marcellin P, Lee SS, et al. Randomised trial of interferon alfa-2b and ribavirin for 48 weeks or for 24 weeks versus interferon alfa-2b plus placebo for 48 weeks for treatment of chronic infection with hepatitis C virus. Lancet1998;352:1426–32. Davis GL, Esteban-Mur R, Rustgi V, et al. Interferon alfa-2b alone or in combination with ribavirin for the treatment of relapse of chronic hepatitis C. N Engl J Med1998;339:1493–9. McHutchison JG, Gordon SC, Schiff ER, et al. Interfereon alfa-2b alone or in combination with ribavirin as initial treatment for chronic hepatitis C. N Engl J Med1998;339:1485–92. Hourigan LF, Macdonald GA, Purdie D, et al. Fibrosis in chronic hepatitis C correlates significantly with body mass index and steatosis. Hepatology1999;29:1215–19. Rubbia-Brandt L, Quadri R, Abid K, et al. Hepatocyte steatosis is a cytopathic effect of hepatitis C virus genotype 3. J Hepatol2000;33:106–15. Luyckx FH, Lefebvre PJ, Scheen AJ. Non-alcoholic steatohepatitis: association with obesity and insulin resistance, and influence of weight loss. Diabete Metab2000;26:98–106. Monto A, Alonzo J, Hirsch K, et al. Steatosis on liver biopsy in patients with hepatitis C is associated with obesity and diabetes, but not with life-time alcohol use. Hepatology2000;32:265A. Adinolfi LE, Gambardella M, Andreana A, et al. Steatosis accelerates the progression of liver damage of chronic hepatitis C patients and correlates with specific HCV genotype and visceral obesity. Hepatology2001;33:1358–64. Ishak K, Baptista A, Bianchi L, et al. Histological grading and staging of chronic hepatitis. J Hepatol1995;22:696–9. Ramm GA, Crawford DH, Powell LW, et al. Hepatic stellate cell activation in genetic haemochromatosis. 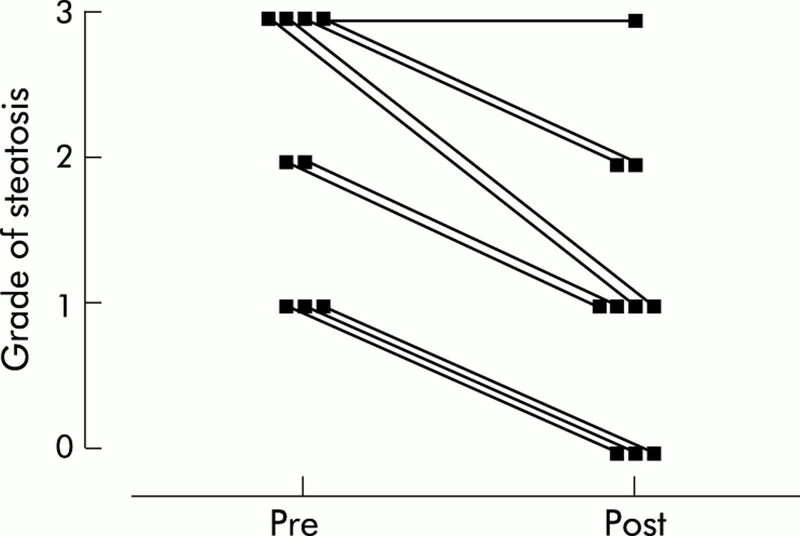 Lobular distribution, effect of increasing hepatic iron and response to phlebotomy. J Hepatol1997;26:584–92. Matthews DR, Hosker JP, Rudenski AS, et al. Homeostasis model of assessment: insulin resistance and β-cell function arising from fasting plasma glucose and insulin concentrations in man. Diabetologia1985;28:412–19. Lean ME, Han TS, Morrison E. Waist circumference as a measure for indicating need for weight management. BMJ1995;311:158–61. Booth ML, Hunter C, Gore CJ, et al. The relationship between body mass index and waist circumference: implications for estimates of the population prevalence of overweight. Int J Obes2000;24:1058–61. Jonsson JR, Hourigan LF, Purdie D, et al. Body composition and hepatic steatosis as precursors of fibrosis in chronic hepatitis C patients. Hepatology1999;30:1531. Adinolfi LE, Utili R, Ruggiero G. Body composition and hepatic steatosis as precursors of fibrosis in chronic hepatitis C patients. Hepatology1999;30:1530. Moriya K, Yotsuyanagi H, Shintani Y, et al. Hepatitis C virus core protein induces hepatic steatosis in transgenic mice. J Gen Virol1997;78:1527–31. Mihm S, Fayyazi A, Hartmann H, et al. Analysis of histopathological manifestations of chronic hepatitis C virus infection with respect to virus genotype. Hepatology1997;25:735–9. Clouston AD, Jonsson JR, Purdie DM, et al. Steatosis and chronic hepatitis C: analysis of fibrosis and stellate cell activation. J Hepatol2001;34:314–20. Issa R, Williams E, Trim N, et al. Apoptosis of hepatic stellate cells: involvement in resolution of biliary fibrosis and regulation by soluble growth factors. Gut2001;48:548–57. Palmer M, Schaffner F. Effect of weight reduction on hepatic abnormalities in overweight patients. Gastroenterology1990;99:1408–13. Ueno T, Sugawara H, Sujaku K, et al. Therapeutic effects of restricted diet and exercise in obese patients with fatty liver. J Hepatol1997;27:103–7. Chavin KD, Yang S, Lin HZ, et al. Obesity induces expression of uncoupling protein-2 in hepatocytes and promotes liver ATP depletion. J Biol Chem1999;274:5692–700. Arsenijevic D, Onuma H, Pecqueur C, et al. Disruption of the uncoupling protein-2 gene in mice reveals a role in immunity and reactive oxygen species production. Nat Genet2000;26:435–9. Dong W, Selgrade MK, Gilmour IM, et al. Altered alveolar macrophage function in calorie-restricted rats. Am J Respir Cell Mol Biol1998;19:462–9. Jolly CA, Fernandes G. Diet modulates Th-1 and Th-2 cytokine production in the peripheral blood of lupus-prone mice. J Clin Immunol1999;19:172–8. Shimomura I, Bashmakov Y, Ikemoto S, et al. Insulin selectively increases SREBP-1c mRNA in the livers of rats with streptozotocin-induced diabetes. Proc Natl Acad Sci USA1999;96:13656–61. Safer DJ. Diet, behavior-modification, and exercise: a review of obesity treatments from a long-term perspective. South Med J1991;84:1470–4.